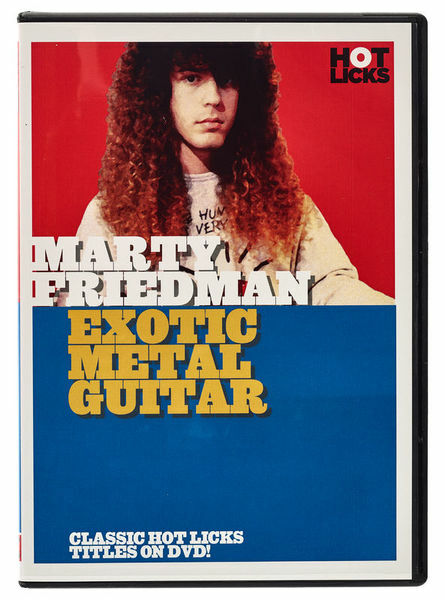 Marty Friedman hails from the San Francisco Bay Area and is one of the most unique metal guitarists! If you are a fan of Marty's music and guitar style, this is a great insight into not only his technique, but how he thinks about note choice and phrasing. It seems to have been recorded around his time in Cacophany with Jason Becker, however, the material he covers hasn't really dated. He goes very in depth regarding the most famous elements of his style - using unusual and exotic scales, incorporating odd note groupings into solo and how to extend licks to create long flowing lead lines. Everything is done at both slow and fast speeds and the tab for the licks is shown on screen, making it a little easier to follow it. The only negative about it is that the accompanying tab book only covers the final solo he plays at the end of the DVD, so you will have to copy the tab from the screen, if you want it in print. Yes, if you have time to pass everyday with it, you will not recognise your self as a guitarist at the end. It will push you to a very high level. Highly Recommended!!!! ID: 250987 © 1996–2019 Thomann GmbH Thomann loves you, because you rock!